Be the first to share your favorite memory, photo or story of Mary Sue. This memorial page is dedicated for family, friends and future generations to celebrate the life of their loved one. 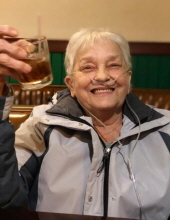 Age 71 of Owosso passed away Wednesday, March 20, 2019 at Memorial Healthcare. The family will receive friends at Nelson-House Funeral Home on Saturday, March 30, 2019 from 4pm to 7pm. Suzie was born March 31, 1947 in Saginaw, the daughter of Mancell and Wava (Hammond) Boyd. She graduated from Chesaning High School. Suzie enjoyed playing pool and gardening. She was employed with Fortune House for 20 years as a server. many nieces, nephews and other family members and friends. The family wishes to extend a special thank you to Shannon, Jessie, Joanie, Dodie, Mikie-Moo, Johnny Wayne and Tyler. She was predeceased by her parents and sister-in-law Jarlene Boyd. To send flowers or a remembrance gift to the family of Mary Sue Dumond, please visit our Tribute Store. "Email Address" would like to share the life celebration of Mary Sue Dumond. Click on the "link" to go to share a favorite memory or leave a condolence message for the family.